What a surprise 🙂 I am honored. So! Let’s get to work, here, peeps! I had another blog at growinginjesus.com and was so bothered because I didn’t know how to connect to a community. Then I came here and well, there are so many people to connect with, and I am so so so glad! I love prophecy! Hearing God’s voice is something I want to help others learn to do! Jennifer’s Hope. Absolutely one of my favorite bloggers! If you visit any of these blogs, visit hers. Everything she writes hits my heart. Always a blessing & an encouragement! Tyler’s Heart. I really enjoy his posts. He’s currently going through the Bible and has a great testimony. God bless him! Peaceful Wife. I love the advice and encouragement about marriage in her posts! Always refreshing. Life on the Potter’s Wheel. Short, encouraging little posts! lovesick & fearless. A missionary/author/friend I met in Israel some time ago. She is always inspiring and stirring up passion and encouragement! With love, may God bless you today! 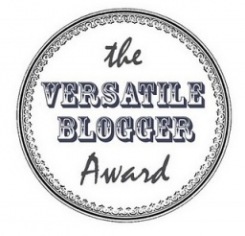 By JenIn Uncategorized8 Comments on Versatile Blogger Award! Previous Previous post: Some verses I’ve been thinking about. I just saw this!! Thank you!